Make sure to go back and check your answers. If you’re a stellar high school student planning on applying to top colleges, it’s imperative that you ace the SAT. This standardized test is weighed heavily by admissions committees and a good opportunity for you to show off your smarts. Here are some tips to make sure you perform to the maximum on the multiple-choice part of the writing section. Check to see if your pronouns agree. The makers of the SAT most frequently test the pronoun agreement rule in their multiple-choice questions. The trick here is to see if the noun is plural or not, then assign an appropriate pronoun. If the sentence refers to “someone” eating a salad, don’t fall for the gender-neutral “their”, as in “someone eating their salad”. “Their” is plural and the correct answer would be a singular pronoun such as “her”. Subject-verb agreement also follows the plurality rule. The premise behind this rule piggybacks on that of pronouns: Use a singular verb with a singular subject and a plural verb with a plural subject. However, the SAT writers go out of their way to make the test more difficult, placing the subject and verb far, far away from each other. When reading the sentence, focus and underline the subject so that when you come upon the verb, you can clearly pinpoint the correct form. Don’t confuse adverbs with adjectives. Adverbs generally end in –ly, such as terribly and nicely, and are used to describe verbs or other adverbs. Adjectives are used to describe nouns. The most common misuse of an adverb and adjective that turn up on the SAT is that of well and good. Does Patrick perform his solo good? No, Patrick performs his solo well. Watch out for homonyms and nonexistent words. 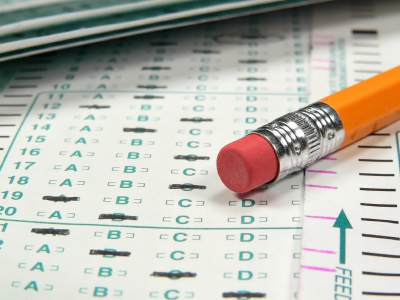 Cramming might have a negative affect/effect on your score. This is a common mix-up that many people struggle with, as affect and effect are homonyms: words that sound the same but have different meanings. Make sure to think about the definition of both choices before you bubble in your answer. I should have/should of done my homework earlier. In this case, “should of” is an expression that does not exist, but often sounds like a spoken phrase. Be careful- don’t confuse how you speak with what is grammatically correct. Practice with old SAT tests and you’ll surely see these errors pop up throughout the writing section. Armed with your new knowledge, you’ll definitely breeze through the practices and go on to conquer the real deal.